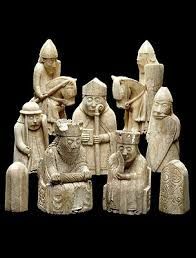 Welcome to Limerick Chess Club! 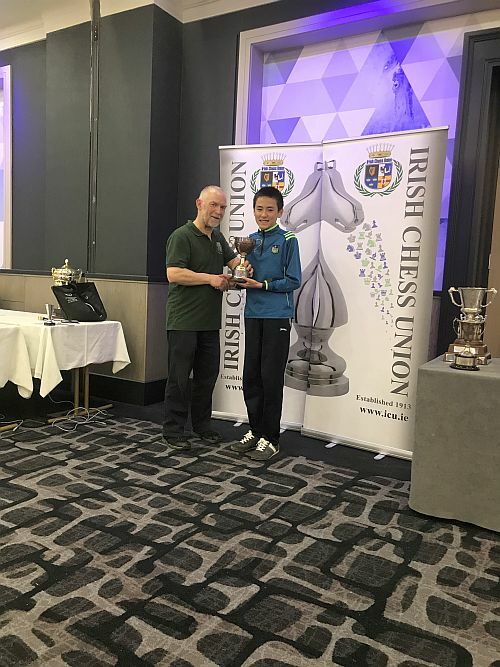 Con Kirby receiving his Irish Juniors U-14 champion trophy from ICU Junior officer Desmond Beatty on 15 April 2019. Con scored 5.5/6 points. 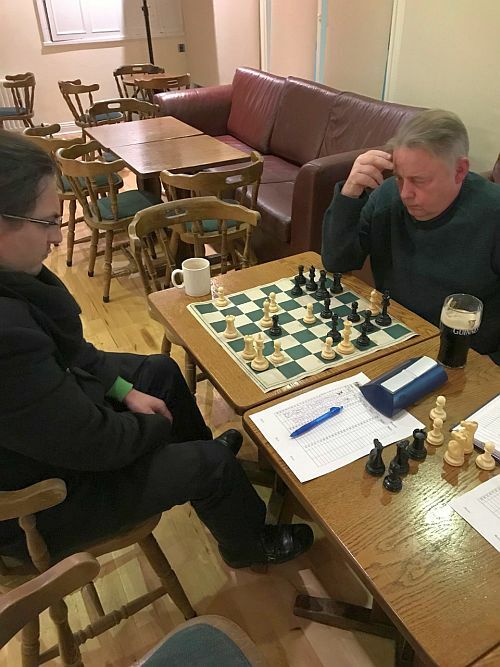 Limk Club Championship 2018-19 rd 3 Denislav Chavdarov v Liam O'Brien played on 3rd Jan 2019. Denislav won this exciting game. 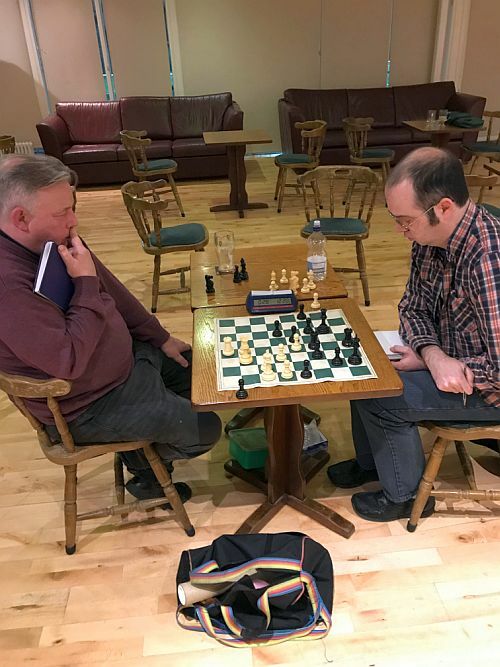 Liam O'Brien v Tim Dineen in Club Ch rd 5 played on 20th Feb 2019. Tim outplayed Liam in the middlegame and an upset was on but in bad time trouble Tim fell for a mating attack by Liam. 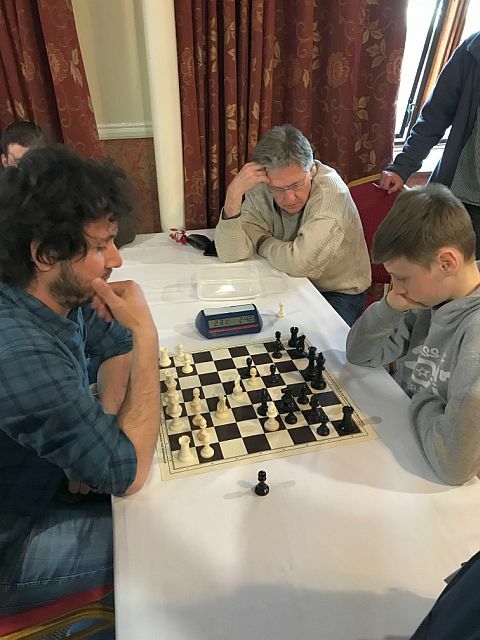 Azzizbek Shamsiddinov won v Dylan Murphy in the Ennis 2018 Under 1400 section 3 min plus 2 sec increment blitz playoff. 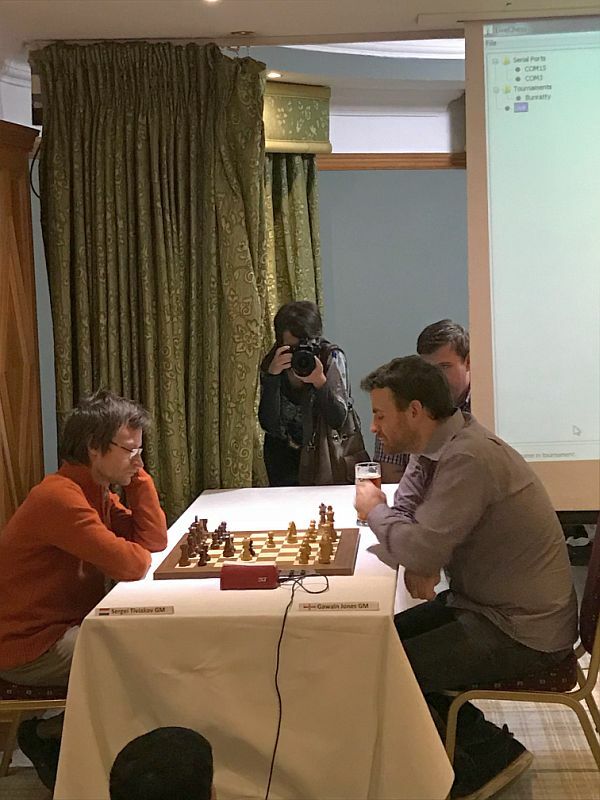 Joint winners GM Sergei Tiviakov(Neth) beat GM Gawain Jones(England) in the Bunratty 2018 Masters section blitz playoff. CLUB CHAMPIONSHIP 2017-18, RD 7 RESULTS/PHOTOS. Kevin O'Flaherty is 2018 Club Champion on 6/7 points. TOM WHITE CUP SWISS 2017-18, RD 6 RESULTS/PHOTOS. James Naughton is the 2018 Tom White Cup winner on 5.6/6 points. CLUB CHAMPIONSHIP 2016-17, RD 7 RESULTS/PHOTOS. Kevin O'Flaherty is 2017 Club Champion. 2018-19 Club championship rd 7 draw see above. To finish by 8th May 2019 . Fri-Sun 5-7th Apr 2019 - The National Club Chs, Gonzaga College, Sandford road, Ranelagh, Dublin 6. See ICU website for details. 17-22nd Apr 2019 - The Irish Intl Open 2019, Gonzaga College, Sandford road, Ranelagh, Dublin 6. See ICU website for details. Sun 28 Apr 2019 - MCU League Div 1, rds 9(12 pm) and 10(5 pm), Charleville Park hotel, Charleville. See MCU website for details. Sun 28 Apr 2019 - MCU League Div 2, rds 9(12 pm) and 10(4 pm), Charleville Park hotel, Charleville. See MCU website for details. 2018 Club AGM was held on Wed 19th Sept 2018. 2017 AGM minutes is in News section. CLUB VENUE ADDRESS AND DIRECTIONS - LIMERICK LAWN TENNIS CLUB, ENNIS ROAD. Opposite John F Kennedy Memorial School, entrance next to the chemist. Refer to the LOCATION MAP on left.